← 9/11 Responders and Their Families Need Your Help! I write with some embarrassment. I thought I knew everything there was to know about the horrors of fracking. After all, I’d been at the NY City Council meeting (along with Josh Fox) where the truth of what was facing us first came to light (Christine Quinn was against it then). I saw the rushes from Gasland on wrinkled bed sheets in loft spaces when we were all scrambling to get it together. I saw – and was blown away – by Gasland 2. I’ve been to countless rallies and meetings. I know about radon, failing well casings, SGEIS statements, methane flaring, silica dust, brine on roads, and polluted aquifer. 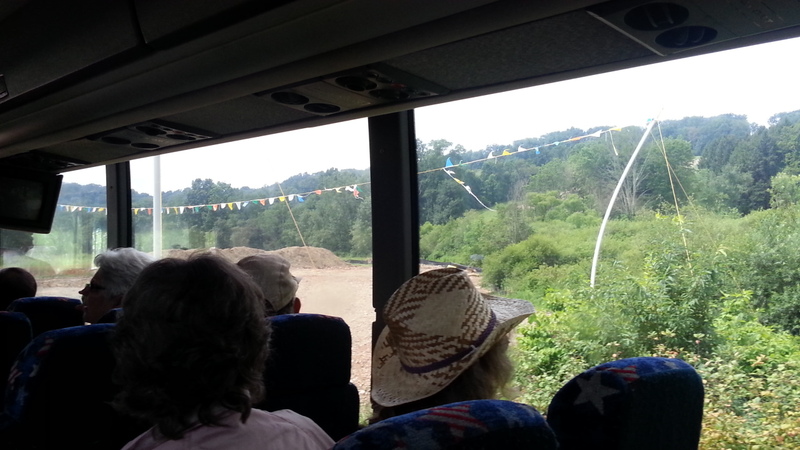 So when I signed up to go on a “tour” of fracking sites in PA on July 27th, I almost felt foolish. The tour was officially sponsored by Food and Water Watch and United for Action, and I knew both Eric Weltman and Ling Tsou from other trips, which was great. 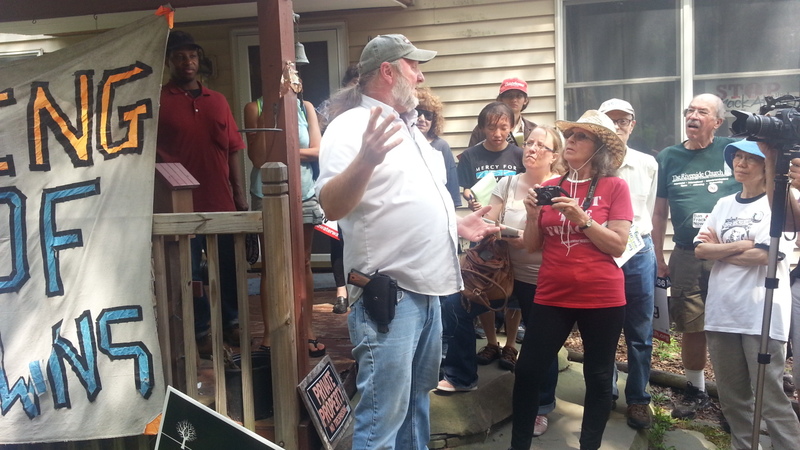 In Montrose, we were joined by warriors on the front lines: Vera Scroggins and Craig Stevens. They are intrepid! 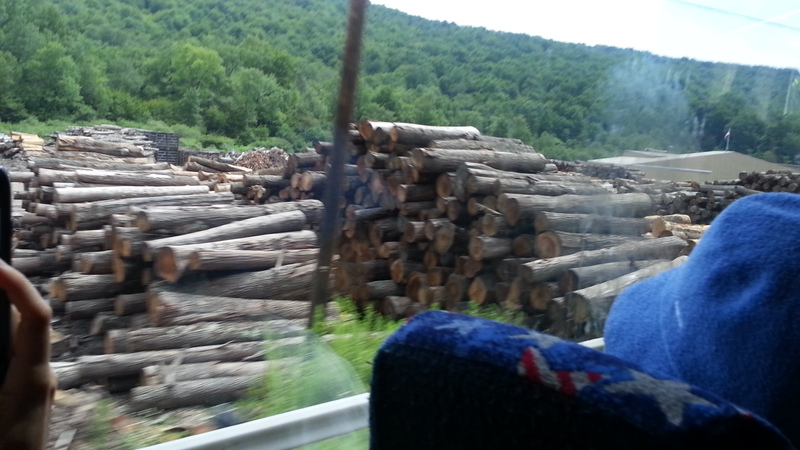 As our bus carried us further and further into the heart of darkness (I am not exaggerating), they narrated. Vera told us that at fracking sites recently, she had seen huge clouds of silica dust. The workers were not calling anyone about it, so she called OSHA. 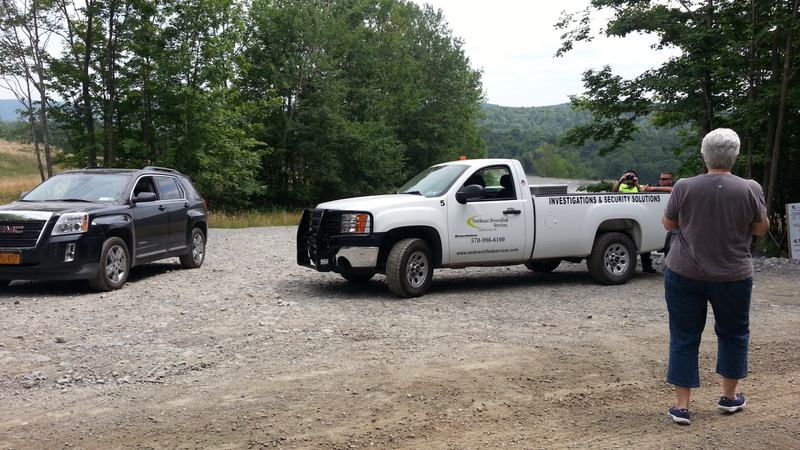 They came and busted Haliburton violations for overexposure to workers of silica dust – and levied fines. There are many fracking companies working up there: Cabot, Southwestern, Chief, WPX, Chesapeake, Carrizo. Drilling is being reduced right now because prices have fallen for gas; so the companies are concentrating on compressor stations. These stations compress and dehydrate the gas to make it ready for market. They are LOUD and the noise is 24/7. Here is one of them. 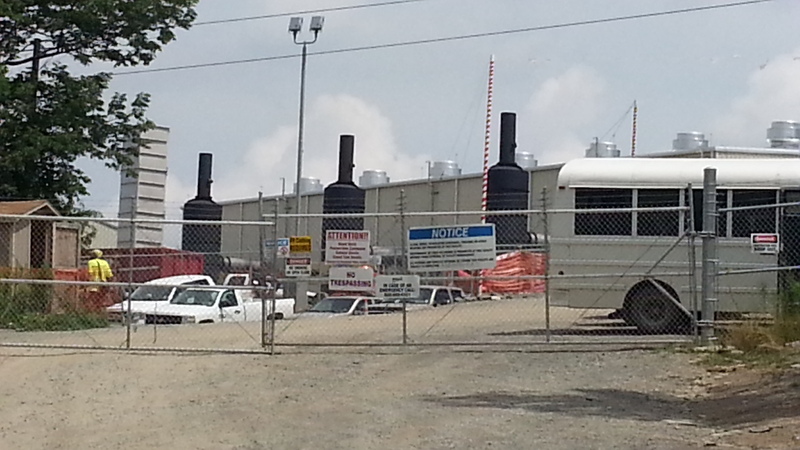 This compressor station is working right next to a graveyard where one of Vera’s old friends lies. No justice, no peace. 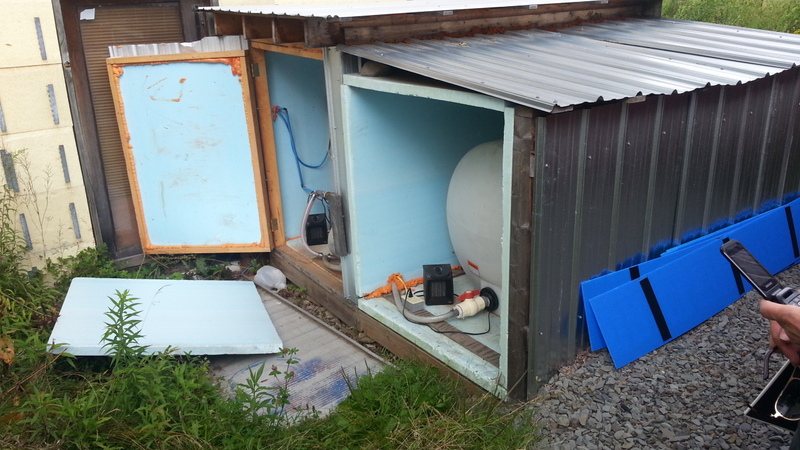 The land for this compressor station was sold to the gas company by a Mr. Wells (honest!). It emits about a dozen different contaminants. And unlike wells, no setbacks are required for compressor stations or pipelines. They can be right next door to you. Two months ago this station exploded. The residents were not contacted, and when the first responders came, they used no sirens. They like to keep a low profile in Montrose. 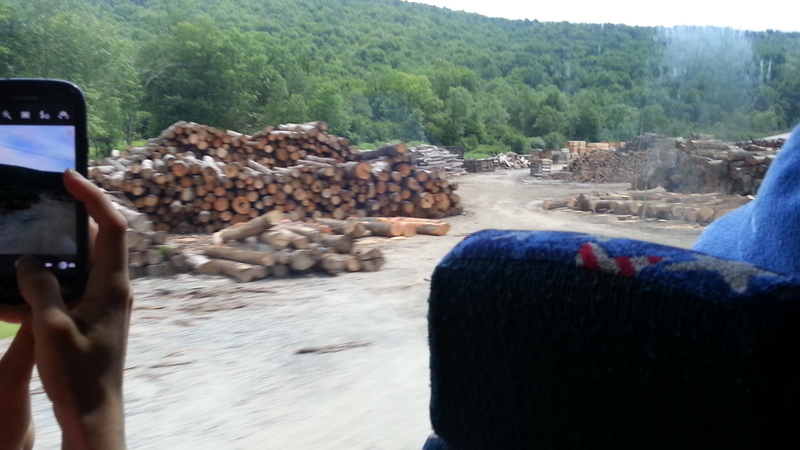 For quite some time now, industry trucks have been trucking this waste into New York State!! 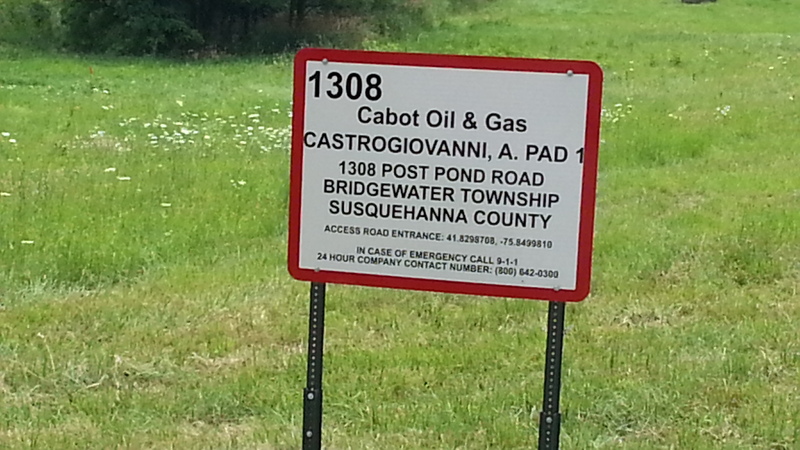 (marcellusgas.org, or PA DEP site). This is a disaster!! 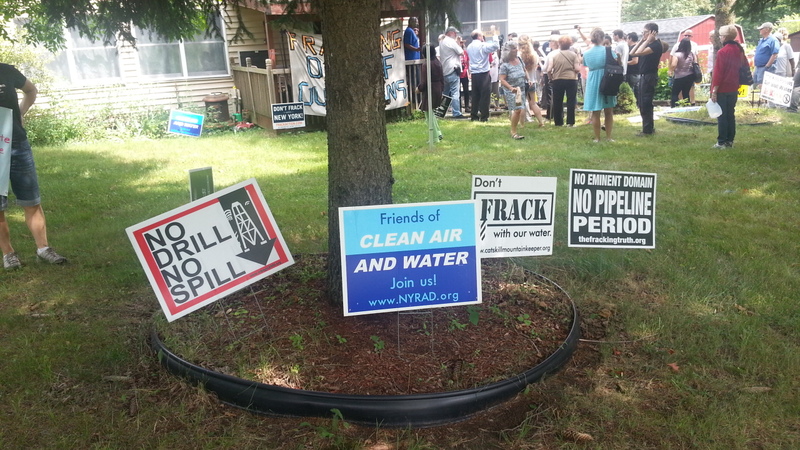 It is bad precedent for New York, and brings poisonous waste into New York State whether we frack or not! There is a bill to stop it. Call your legislator and tell your them to back the bill not to allow trucking fracking waste into New York State. But back to our trip. We started in Montrose. Montrose lake is very pretty. It is also the source of water for 1600 residents. But Vera told us it is heavily chlorinated at the treatment plant on the lake. All is not as it seems in Montrose. So most people go to this. 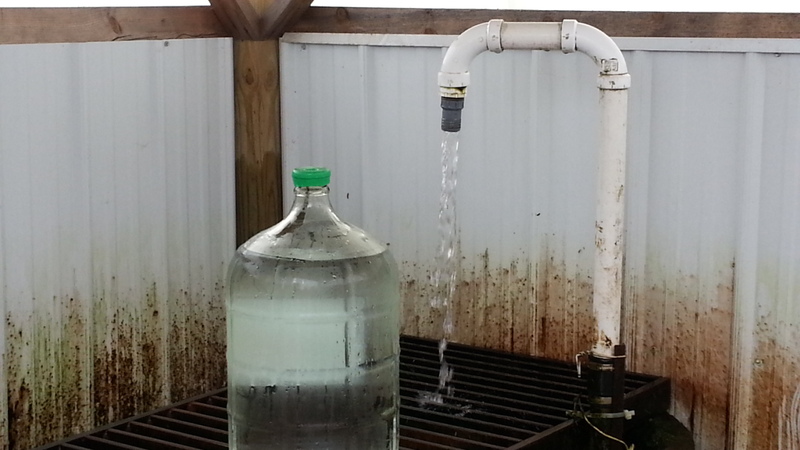 It is an artesian well – people come from miles around to get water here. As our trip progressed, we saw these festive flags. They are not Tibetan prayer flags. They signal a fracking site. 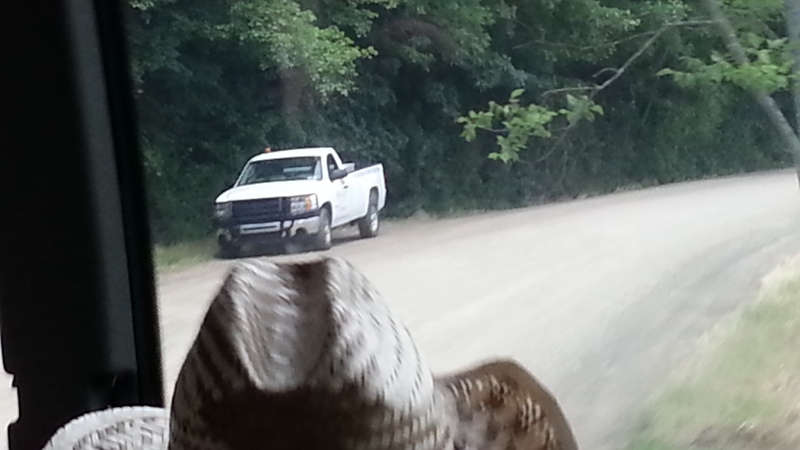 It was a stand-off: they took pictures of us, and we took pictures of them. And how about this guy? cute, huh? He met us at every single site. He’s a gas industry operative and talked at us aggressively, using industry talking points. He went from being mildly attractive, to extremely annoying. A total industry puppet. The woman next to him photographed us. 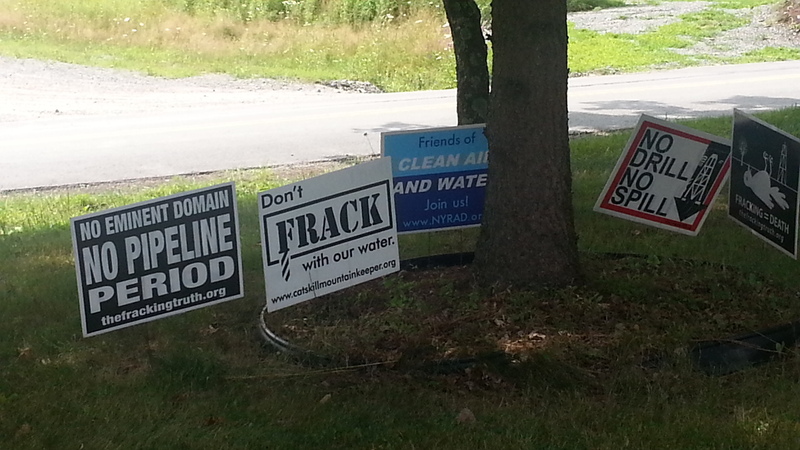 Once we got to Dimock – ground zero for gasland – we saw these about every half mile or so. 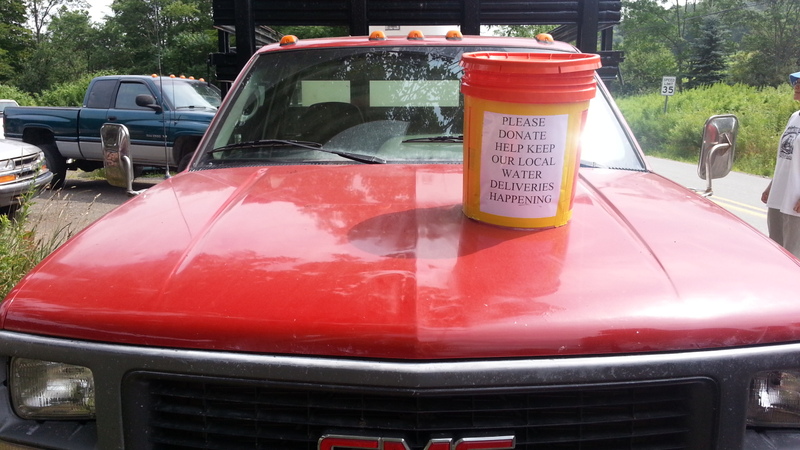 Dimock has 160 wells in 30 square miles – and they are not finished drilling. The gas companies are not good neighbors. They promise jobs to the community, but only 10% of their workforce is local. The rest are brought in from outside. Drilling casings fail 9% of the time from the beginning. Sometimes they can be fixed, sometimes not but they just keep on drilling. 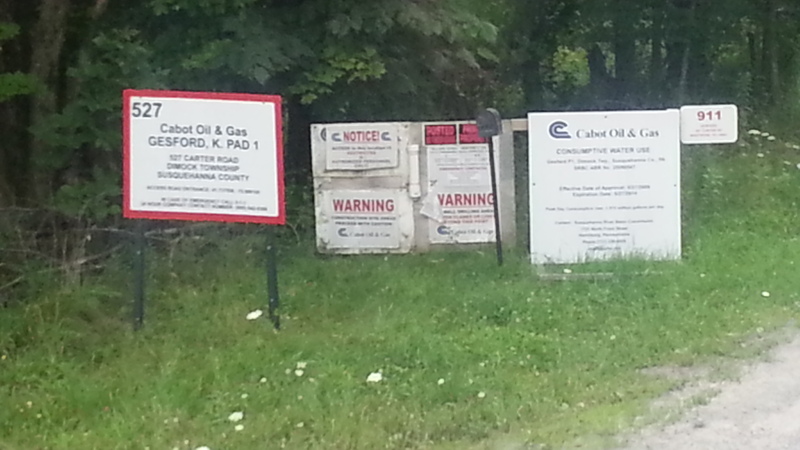 Cabot Industries has 400 outstanding violations. At a certain point, I just stopped taking pictures, there were so many of them. 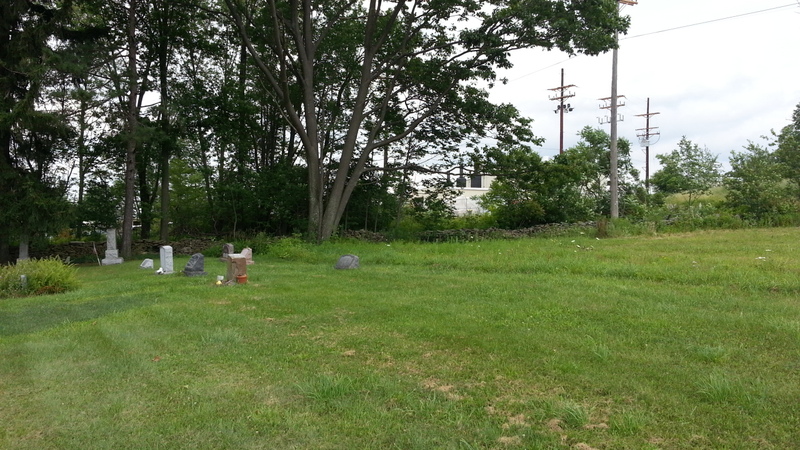 As a point of interest, in the signs with the red border you will see the name of the landowner who agreed to lease. In this case it’s Castrogiovanni. The industry was not glad to see us coming. If you look to the right, you’ll see they actually brought out a “Dust Broom” for road cleaning, to make sure we did not trespass on their site. 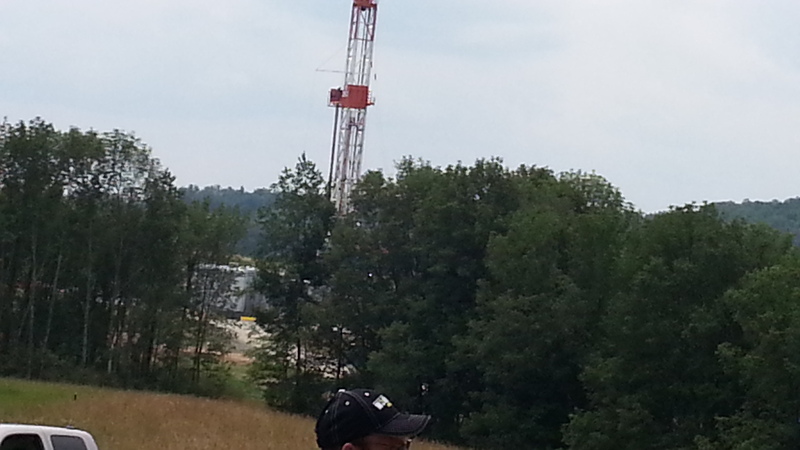 And here is an actual fracking site – this was as close as we could get. 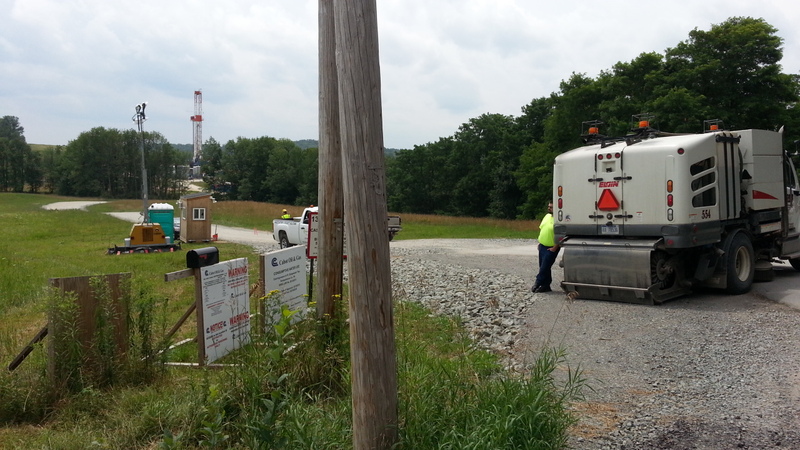 Landowners who have leased to the gas companies have signed non-disclosure agreements. The Wooten family, a wealthy family in Montrose, chose to lease. They like to portray themselves as philanthropists though, and put a Yoga Healing Center in the center of town. Likewise, Cabot Industries donated $4 mill for a new hospital. They’re going to need it. The saddest thing about all of this was to see the failure of both spiritual and elected leaders in this area. Both Montrose and Dimock have many sweet little churches. Although the community is under siege by the gas industry, the church leaders are totally silent on the subject of fracking. 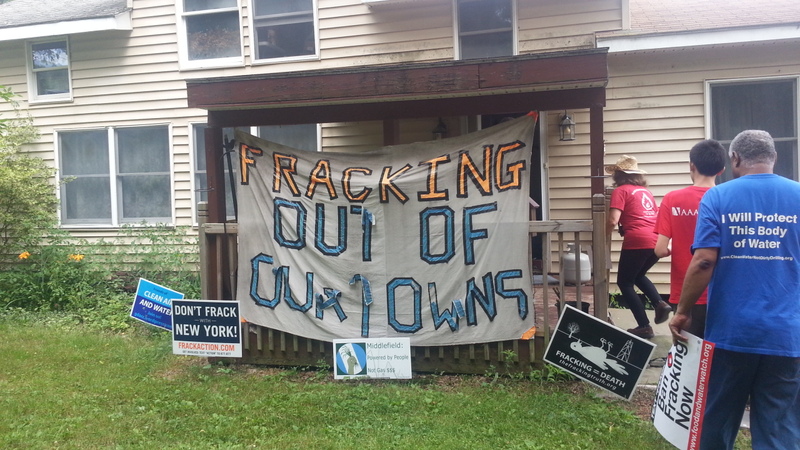 And, we learned, only two elected officials for Susquehanna County have ever been to visit anyone affected negatively by fracking (there has been more luck getting legislators from out to state to come). The residents there are on their own. And the industry does not play fair. Just as Josh said in “Gasland 2”, I learned the psyops tactics they use to destroy both the land and community. They go into a community and pressure the landowners, telling them if they don’t lease, the company is going to go under their property and get the gas anyway. They turn neighbor against neighbor with non-disclosure agreements, settling on different sums for different landowners. But no one is happy these days because the price of gas is down. To keep their profit margins healthy, the industry has reduced their payments to landowners. His name is Ray Kemble and he used to work for the gas industry. 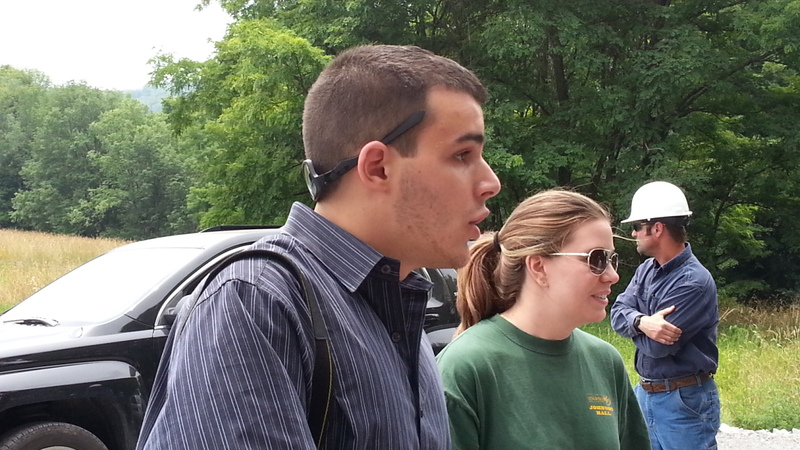 He is a whistleblower – a dangerous thing to be in Dimock, PA – who has endured slander and abuse from his neighbors and constant harassment from the industry. He does his grocery shopping outside of the county to avoid harassment from people who used to be his friends. And Ray does not back down! You’ll notice Ray carries a side arm. The police from Montrose now essentially work for Cabot Industries. Gas operatives have walked into his house unannounced, constant intimidation. When a neighbor of Ray’s assaulted him as he went for water, the police showed up and asked for Ray’s ID. Standing next to him is one of our guides, Craig Stevens. 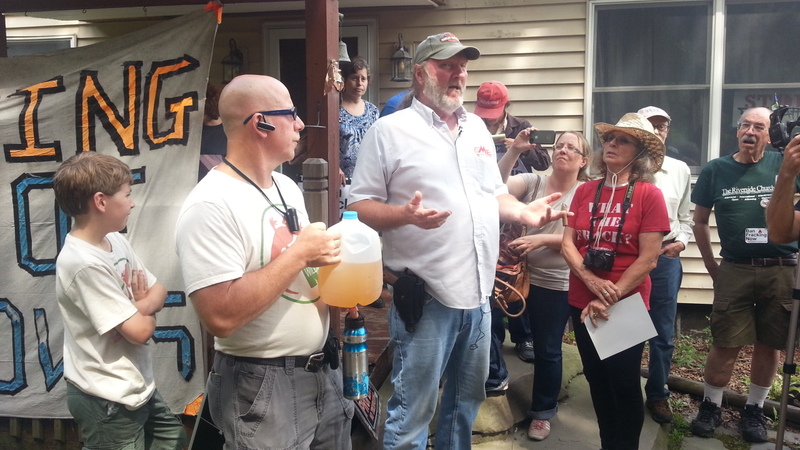 The water he is holding has been fracked. The EPA and DEP claim it’s safe for residents of Dimock to drink – but they won’t drink it themselves if it’s offered to them (no surprise). When Craig accidentally spilled it on his hand, his hand was numb for hours. He has to shell out $200 a month in the winter to heat them so they won’t freeze. 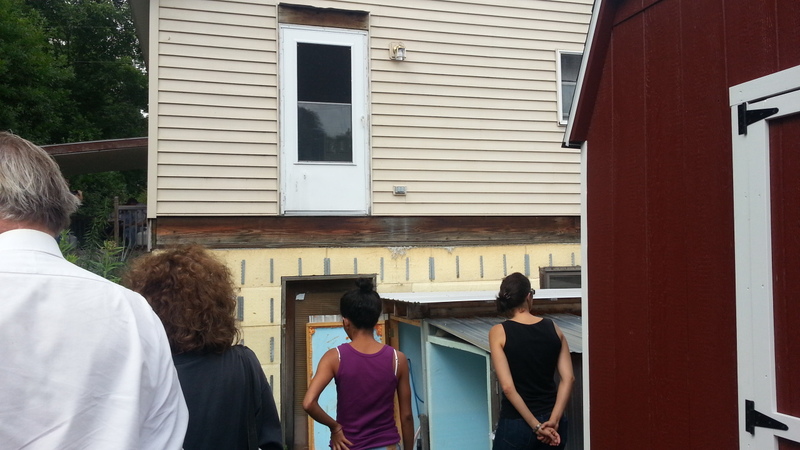 Check THIS out: when the gas industry was first providing water to Ray, they came when he was out, shucked off his deck and left him with a door that goes nowhere. This is how they behave if you get in their way. As we headed home, one of our number began to brainstorm about a fundraising site for Ray. His sacrifices for clean air and clean water have benefited us all. I will keep you updated on any funding site we put up. 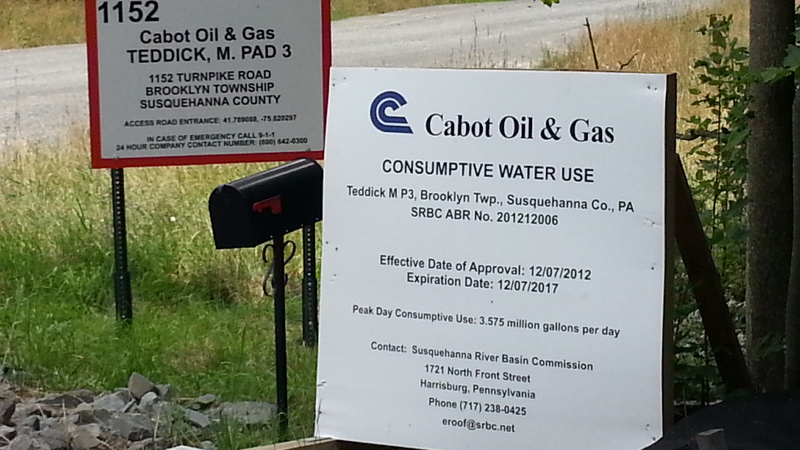 Pingback: Michigan, Cannon Township’s moratorium on hydraulic fracturing.